You can add widgets to your website in order to display content from a third party website, while keeping your visitors on your site. Some examples are: virtual tours, maps, or any third party code you receive from a vendor. Add a new article with a specific URL. Insert the widget where you want it to appear in the Body section of the article. Link the article to the Menu (via its URL) or reference the article in other sections of the CMS. Start by creating an article. Scroll down towards the "Body" field and click on the HTML icon visible in the Body toolbar. 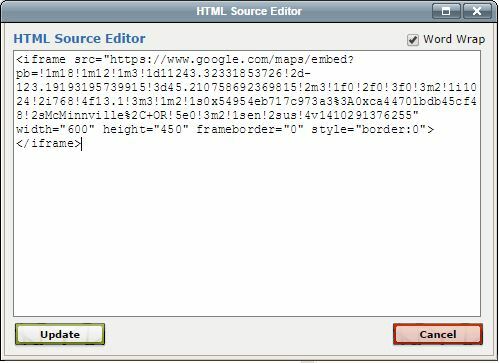 This will open a dialog window titled "Html Source Editor". Your article is now ready to be tested before you link it to the menu or distribute the URL. Once you've saved the article, you may open a new browser window and navigate to the URL you gave to the article. Now link your article to the top menu, hyperlink to it from other articles, or share the url via email.